What Do We Mean When We Talk About Craving? An essay on drug addiction and need. For years, craving was represented by the tortured tremors and sweaty nightmares of extreme heroin and alcohol withdrawal. Significantly, however, the one symptom common to all forms of withdrawal and craving is anxiety. This prominent manifestation of craving plays out along a common set of axes: depression/dysphoria, anger/irritability, and anxiety/panic. These biochemical states are the result of the “spiraling distress” (George Koob’s term) and “incomprehensible demoralization” (AA’s term) produced by the addictive cycle. 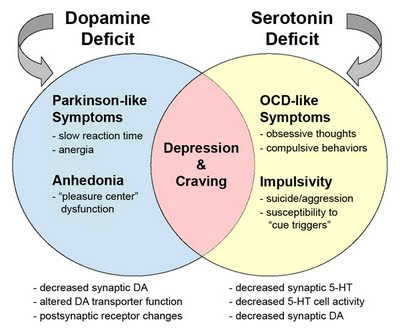 The mechanism driving this distress and demoralization is the progressive dysregulation of brain reward systems, leading to biologically based craving. The chemistry of excess drives the engine of addiction, which in turn drives the body and the brain to seek more of the drug. Whatever the neuroscientists wanted to call it, addicts know it as “jonesing,” from the verb “to jones,” meaning to go without, to crave, to suffer the rigors of withdrawal. Spiraling distress, to say the least—a spiraling rollercoaster to hell, sometimes. Most doctors don’t get it, and neither do a lot of the therapists, and least of all the public policy makers. Drug craving is ineffable to the outsider. As most people know, behavior can be conditioned. From maze-running rats to the “brain-washed” prisoners of the Korean War, from hypnotism to trance states and beyond, psychologists have produced a large body of evidence about behavior change—how it is accomplished, how it can be reinforced, and how it is linked to the matter of reward. It is pointless to maintain that drug craving is “all in the mind,” as if it were some novel form of hypochondria. Hard-core addicts display all the earmarks of the classical behavioral conditioning first highlighted almost a century ago by Ivan Pavlov, the Russian physiologist. Pavlov demonstrated that animals respond in measurable and repeatable ways to the anticipation of stimuli, once they have been conditioned by the stimuli. In his famous experiment, Pavlov rang a bell before feeding a group of dogs. After sufficient conditioning, the dogs would salivate in anticipation of the food whenever Pavlov rang the bell. This conditioned response extended to drugs, as Pavlov showed. When Pavlov sounded a tone before injecting the dogs with morphine, for example, the animals began to exhibit strong physiological signs associated with morphine use at the sound of the tone alone. Over time, if the bell continued to sound, but no food was presented, or no drugs were injected, the conditioned response gradually lost its force. This process is called extinction. Physical cravings are easy to demonstrate. Abstinent heroin addicts, exposed to pictures of syringes, needles, or spoons, sometimes exhibit withdrawal symptoms such as runny noses, tears, and body aches. Cravings can suddenly assail a person months—or even years—after discontinuing abusive drug use. Drug-seeking behavior is a sobering lesson in the degree to which the human mind can be manipulated by itself. The remarkable tenacity of behavioral conditioning has been demonstrated in recent animal studies as well. When monkeys are injected with morphine while recorded music is played, the music alone will bring on withdrawal symptoms months after the discontinuation of the injections. When alcoholics get the shakes, when benzodiazepine addicts go into convulsions, when heroin addicts start to sweat and twitch, the body is craving the drug, and there is not much doubt about it. But that is not the end of the matter. While cravings can sometimes drive addicts in an almost autonomic way, drug-seeking urges are often closely related to context, setting, and the expectancy effect. It has become commonplace to hear recovering addicts report that they were sailing through abstinence without major problems, until one day, confronted with a beer commercial on television, or a photograph of a crack pipe, or a pack of rolling papers—or, in one memorable case of cocaine addiction, a small mound of baking powder left on a shelf—they were suddenly overpowered by an onrush of cravings which they could not successfully combat. “If you put them in a setting where the drug is not available, but the cues are,” said Sellers, “it will evoke a conditioned response, and you can show that the desire to use goes up.” Most people have experienced a mild approximation of this phenomenon with regard to appetite. When people are hungry, a picture of a cherry pie, or even the internal picture of food in the mind’s eye, is enough to cause salivation and stomach rumblings. Given the chemical grip which addiction can exert, imagine the inner turmoil that the sight of a beer commercial on television can sometimes elicit in a newly abstinent alcoholic. When addicts start to use drugs again after a period of going without, they are able to regain their former level of abuse within a matter of days, or even hours. Some sort of metabolic template in the body, once activated, seems to remain dormant during abstinence, and springs back to life during relapse, allowing addicts to escalate to their former levels of abuse with astonishing speed. This fact, and no other, is behind the 12-Step notion of referring to oneself as a “recovering,” rather than recovered, addict—a semantic twist that infuriates some people, since it seems to imply that an addict is never well, never cured, for a lifetime. What people are buying this science and not the other mentioned before? Huh. Guess the diagrams help. - Dopamine is actually a "seeking" system, it evolved to drive animals to get food. - So impaired receptors may create a feeling of being "starving" all the time. - This leads to "hyper-seeking" behaviors -- often the most harmful aspect of addictions. - Since the brain doesn't have the abiliity to feel "fed" from normal DA activities like eating a regular meal, being with friends and family, watching TV, the impaired brain drives the person to external behaviors that hyper-stimulate DA. - This creates the impulsive/compulsive behaviors. Of course, hyper-stimulating the DA system, with external things just makes the illlness worse. In fact, avoiding extra DA triggering experiences helps to rebuild the receptors a bit in rats. This science is very well understood and studied. However, there is no way to repair a brain so impaired so symptoms management is the best medicine can offer. Actually, there is anecdotal evidence that fried chicken does trigger extra DA. Okay, that was interesting. Everybody had their say. Gonna close this comment thread now.